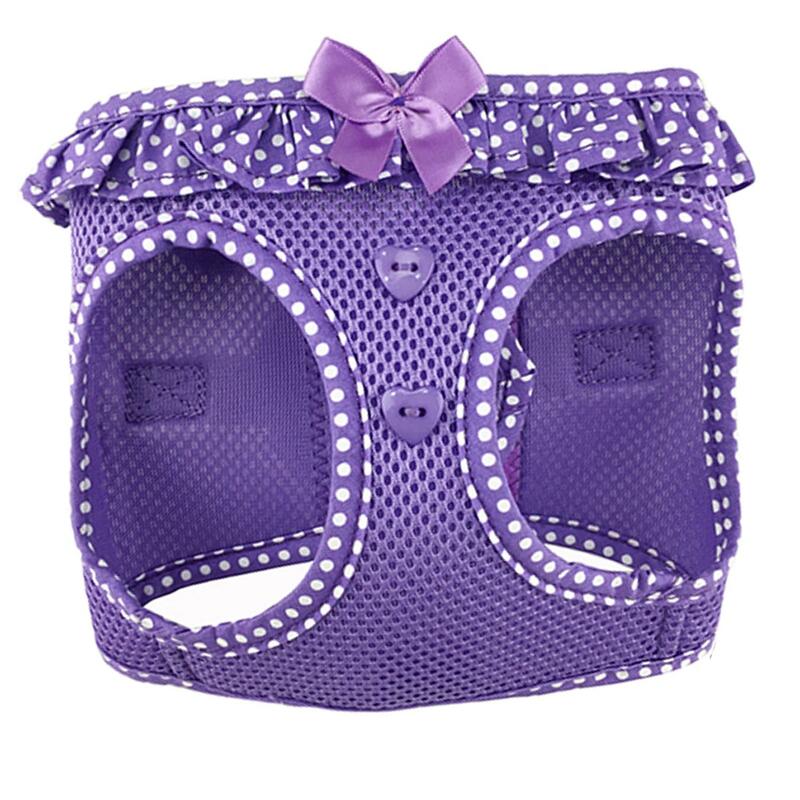 Head out for a walk in safety and fashion with the American River Choke-Free Dog Harness in Purple Polka Dot by Doggie Design! The ever-popular American River Choke-Free dog harness has been given a fashion update with the same safety features you love! 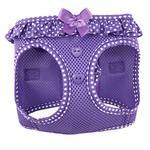 Our new American River Polka Dot harness collection is designed with the small dogs in mind. This line of harnesses ranges from an X-Small to an X-Large and feature a frill around the neck and a fun color matching polka dot trim! Decorative heart buttons and a purple bow completes the look. Athletic mesh fabric keeps your pup cool and comfortable. This step-in harness goes on easily and secures with touch fastener, a quick-snap buckle, and double D-rings. Machine washable. Available in Pink, Purple, and Teal, each sold separately. 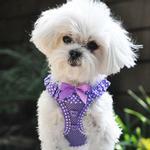 American River Choke-Free Dog Harness by Doggie Design - Purple Polka Dot Customer Photos - Send us your photo! She loves her new harness. Posted On 04/06/19 by Evelyn M from , DE Yes, Evelyn M recommends this product! My foster dog, a pug/chihuahua/?? mix is barrel chested, but has a smaller neck. This works, as I can make the neck a tad tighter, and let the chest be a tad looser to fit her body build. I like the double D-rings, which make it more secure, and aren't sitting high making her look like she has devil horns. I have to admit, the first time she shook, when I unhooked the leash, I swore I had a bunch of castanets in the house. The metal clicks on the plastic of the fasteners, but it was funny. She even stopped and looked at herself to see what the noise was. Easy to step in and step out, and fasten. I got it in purple, she is all black, and looks adorable. .
Posted On 07/16/18 by Jacqueline S from , PA Yes, Jacqueline S recommends this product! I bought this for my dog, a very spoiled maltese, in the purple since she has so much pink and it is just fabulous on her. These are so easy to get in and out of. It's perfect for any dog. I bought a matching one for my daughter's new rescued dog in the pink and both girls look lovely. Posted On 06/22/18 by Nancy M from Little Rock, AR Yes, Nancy M recommends this product! Small fits my 7.5 lb chihuahua with 13 inch chest on tightest setting. Very good quality and has a buckle for security. Now have one in every color !